Kate, you’re off to a good start. I’m sure you’ll make well past “T” this year. Good first blog. Cudos. Yes! A clean slate! Baby farm animals! Happy things! I must admit, I didn’t make it all the way to Z last year either, but … I do remember visiting your site last year and walking away from it with a smile that comes with reading about good food and beautiful plants, and I have the same impression today. Thank you for stopping by again, Alana! I enjoyed your post. Spring is my favourite season but in Australia, we are starting to put the heater on at night! Sharon – Thank you. I’ll be sending warm thoughts your way! Thanks for visiting. Happy day to you too! To new beginnings… 🙂 Thanks for stopping. I’ll be sure to head your way too. I’m new to your blog from the A to Z Challenge – nice to meet you! 🙂 We just cleaned out my garden area- – actually a berry patch of blackberries, raspberries, and strawberries. LOVE them. Yum. Hi! Thanks for stopping. I’m with you on that! Berries are definitely my favorite! 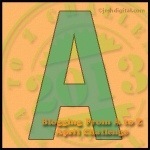 Great post for the letter A. Gardening is one of my favorite things to do. I use loads of horse pucky in my garden. A toast to new beginnings. Cheers Pam! This will be my first year using horse manure instead of cow. Any insight you can offer in that area?